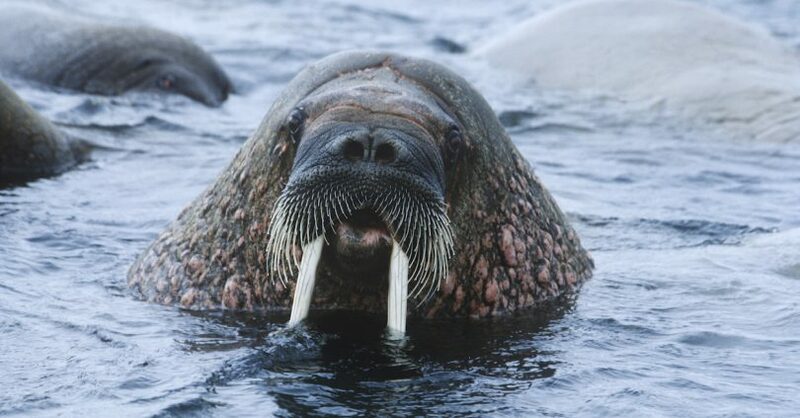 The word walrus likely comes from the Dutch words ‘walvis’ meaning ‘whale’ and ‘ros’ meaning ‘horse’. It dates to the 1650s. Walrus refers to a large sea animal with thick whiskers and long tusks. They have heavy, wrinkled bodies and move awkwardly on land, mostly by hopping short distances, but are excellent swimmers thanks to their wide flippers and strong tails. A walrus can swim as fast as 35 kilometres per hour at its quickest. The walrus can be found most often living in the icy waters near the Arctic Circle. Walruses are very large mammals, weighing anywhere between 600 to 1,500 kilograms and can be up to 3.2 metres long. They are meat eaters but are generally not aggressive unless protecting their territory or looking for a mate. The walrus is best known for its tusks, which it uses to help pull its body out of the water and onto the ice after swimming, to break through thick ice to make holes for breathing, for fighting and for protection. Both male and female walruses have tusks. The tusks on a walrus are actually very long teeth that grow throughout the animal’s life. Some walrus tusks can reach lengths of one metre or more. Since walruses prefer to eat shellfish like oysters and clams, they don’t really need their tusks for hunting. The scientific name for the walrus is Odobenus rosmarus, which means ‘tooth-walking seahorse’ in Latin. View the full definition in the Macmillan Dictionary. Walrus are rarely seen around the UK, but Orkney.com reports that a huge Arctic walrus recently arrived on the shores of the Orkney island of Sanday, much to the delight of local residents and wildlife watchers who flocked to the island for a closer look. Nicknamed, inevitably, ‘Wally’, the walrus relaxed on the beach for 24 hours before slipping back into the sea. It was the first walrus visitor for Orkney since 2013 when one arrived in neighbouring North Ronaldsay.